I have a soft spot in my heart for coffee cake. When I was first learning to bake my mom gave me one of her old cookbooks and I discovered coffee cake. I think I must have made at least one coffee cake a month for about six months. I was in love. As I became more confident in my baking skills I tried harder coffee cake recipes and once I was in college I discovered the great flavor that rum can add. There is something so great about sitting down with a great cup of coffee and homemade coffee cake. Regardless of the time of the day it just feels right. Now when I first went gluten free I thought I would have to give up my beloved coffee cake. Then I decided I would just learn to bake differently. I tried approximately 4 coffee cake recipes that were horrible. I almost gave up. Then I decided to try one more recipe and it came out perfect. So now I am back to regularly baking coffee cake again. On Thanksgiving morning I tried a new recipe for Berry-Orange Coffee Cakes from the November issue of Better Homes and Gardens magazine, which looked delicious and perfect for converting to gluten free. This recipe has 15 ingredients. It takes 25 minutes of baking time, 10 minutes of prep and makes 15 cakes. I had no problems finding any of the ingredients at my local grocery store. When baking gluten free I always use muffin tin liners. 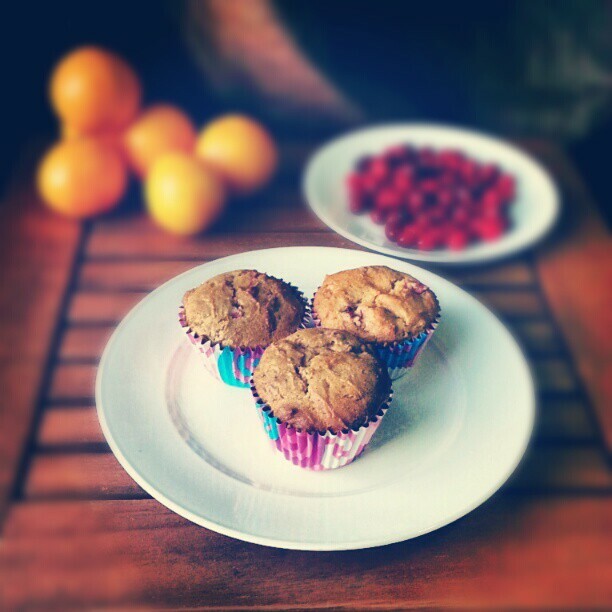 Gluten free muffins tend to stick to the pan easier than their gluten counterparts. My favorite gluten free all-purpose flour uses coconut flour as a base and that it what I used in this recipe. I decided to use slightly less ginger than the recipe suggested, probably approximately one tablespoon instead of two. My two kids aren't big fans of walnuts so I left them off of the top of the cakes as well as the orange peel. Finally, since I made these cakes gluten free I found the baking time to be 5 minutes longer than the recipe suggest. I followed the remainder of the recipe as written. These cakes were very popular on Thanksgiving morning. I left off the glaze on my servings, but put them on my boys cakes. They were flakier than regular wheat muffins, but had a great soft taste. My two in-laws were in town for the week and both thought that these cakes were delicious. If you like ginger you could use the full amount suggested by the recipe or you can reduce the amount like I did. Overall, a great gluten free baking recipe. Thanks :) They turned out really well, especially given that I made them gluten free from a regular recipe. I too am a lover of coffee cake. You make gluten free eating look delicious:) you did an excellent job! Coffee cake is the best :) Thanks for the sweet comments! Thanks for the sweet comments :) Going over to check out your blog hop, thanks for the heads up!